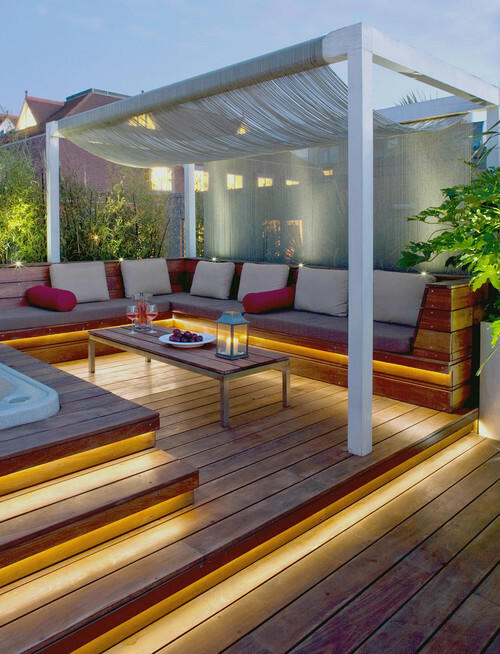 Choosing the perfect lighting scheme for your deck or balcony isn�t always easy. Too much light will make your guests feel like they�re performing on stage, and not enough light will leave everyone squinting and struggling to see � but how do you find the right balance and get that perfect accent glow? The type of LED lights you use will depend on your needs and the level of involvement you want to have in the project. It�s always best to look for LEDs that can withstand the elements when you�re looking for outdoor lighting. Even if your deck or balcony is covered, choosing all-weather, water-resistant lights might be the safest way to go. Outdoor deck and balcony lights can be operated on either 120v AC or 24-volt DC current.. However, for safety reasons, it is usually better to opt for low voltage lighting (24v) when possible if the lighting will be within reach of anyone. In most cases, a warmer color temperature of around 2700 to 3500 Kelvin is ideal, providing a warm and inviting environment. Finding lights with a wide beam angle allows you plenty of flexibility when it comes to where you mount them. In addition, many people prefer the versatility of dimmable lights for an outdoor setting, allowing you to set just the right mood. You can use LED rope lights, LED tape-rope hybrid lights, or waterproof LED tape lights, which meet all the requirements for outdoor LED lighting, from our comprehensive collection. They can be mounted along the outside edges of molding, beneath decorative railings and even along floorboards to create a glowing border. Waterproof LED tape lights are an especially good fit for areas in your deck or balcony that may be subject to high levels of moisture or splashing water, such as around pools or hot tubs. When bright, colorful lights are in order, particularly for creating your own signage or illuminating a feature on your deck or balcony, it�s best to choose flexible neon LED lights, which are available at extremely affordable prices from our catalog. Flexible neon LEDs are available an entire rainbow of colors, giving you the versatility you need to create a fantastic lighting landscape. They�re rated for indoor and outdoor use, featuring tightly packed LED bulbs that mimic the look of traditional glass neon. Most people choose flexible neon lighting to create runners, to illuminate trellises and to create custom lettering above sliding glass doors. Basically anywhere you want the light source to be visible, and make a statement, LED flex neon is the way to go. It saves up to 90 percent on energy costs compared to glass neon, and it can last up to 100,000 hours. 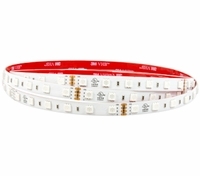 High-output LEDs that are easy to install along borders, beneath overhangs, and around curves are an ideal choice for many deck and balcony projects. When combined with a dimmer, you have complete control over your entire lighting scheme. A tape-rope hybrid, which is a combination of the fantastic illumination that LED tape lights provide coupled with the ease of use and familiarity that rope lights provide, is the perfect choice when you don�t have the inclination to fumble with multiple power sources, separate transformers and other inconveniences that low voltage light can often bring. This type of lighting is incredibly versatile. It blends the brightness of strip lights with the ease-of-installation of rope lights. Because tape-rope hybrids are interconnectable (they can total over 100 feet on a single power source), you can use them to illuminate staircases, outline doors and highlight special features. People choose LED tape-rope hybrids because they�re among the easiest lights to install and manage. We offer LED tape-rope hybrids in several colors, and they�re available in several pre-cut lengths for your convenience. Waterproof LED tape lights are ideal for water features such as fountains, landscapes that are prone to water exposure or high humidity, and near swimming pools and hot tubs. Waterproof LED tape lights are dimmable if you install a dimmable driver. Flexible neon LED lights are extremely flexible, so they can be mounted in any shape. They�re perfect for creating lettering, outlining windows and doorways (or any architectural element), and creating unique and visible shapes. Flex neon is unbreakable, extremely bright, and dimmable. It�s available in two versions: Plus and Economical. Most LED accent lights are designed not to be seen, and to only provide the required �glow� effect. Neon flex is different; it is designed to be viewed straight on, and be a centerpiece of your lighting scheme. 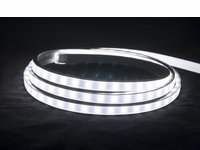 LED tape-rope hybrids are the right choice for projects that require high light output, but also need ease of installation. 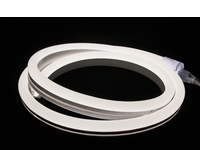 They�re flexible enough for curves but can be easily mounted along straight edges as well. No matter how large your deck or balcony project is, Take Three can help you tackle it.